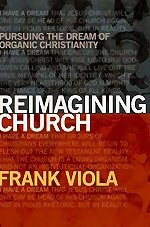 I've just finished the preface and introduction of Frank Viola's book 'Reimagining Church'. It's a good start so I'm much looking forward to reading the rest of the book. Here in the summerhouse at the end of the garden it's shady and cool and conducive to reading but there are other things waiting to be done - maybe one more chapter then I must put the bookmark in. So why am I excited to be reading this book? 1 - It's the sequel to 'Pagan Christianity' that Frank wrote with George Barna (a book I could hardly put down). This examined the origins and history of the church and describes how things changed until what we think of as church today is barely recognisable as a descendant of what Christ started almost 2000 years ago. The source of the rituals, buildings, emblems, practices, structure, management - it's all there. 'Reimagining Church' picks up where 'Pagan Christianity' left off and considers where (and how) we might move on from here. As we loved Christ together our hearts were knit with each other. True change was being made in our lives as we were learning of the Lord's eternal purpose. I saw that the church really is Christ's body, and He is the Head. Only as we allow Him to have His rightful place will we experience His life as we were meant to. Church life in this way is the Christian's natural habitat where we grow and flourish, being nourished by all the riches of Christ. I could go on and on because there is so much more! Wow! Yes! This is absolutely what I feel myself. 3 - It has the loud and persistent ring of truth about it. More than that (here comes some Christian jargon, please excuse me), the Spirit of Christ witnesses with my spirit that truth is being shared. These are things that nobody could invent. They are things that have always been revealed to a few, but now they are opening up in the hearts and minds of many. This is exciting! 4 - It's a practical help and an encouragement to those who are already meeting simply and organically as well as to those who feel something is missing or awry in institutional church. 5 - It might open the eyes of some who haven't yet realised there is an alternative to institutional church. We didn't take full notes on this meeting. However we did pray specifically for particular people. Jim mentioned a young colleague who was tragically killed in a road accident, we prayed for the family and for Jim as he meets with them. We prayed for Sean's brother, for John's continuing recovery, for Kayleigh, and for our families. 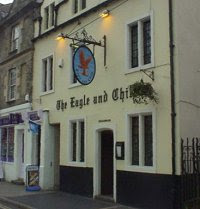 The 'Eagle and Child' is a famous old pub in Oxford, often known to the city's students as the 'Bird and Baby'. It serves the usual range of beers, ciders, wines, and spirits along with typical British mainstays like bangers and mash, steak and ale pie and so on. Its main claim to fame is that it was the meeting place of 'The Inklings', a group of writers active before, during and after the Second World War. 'Who were 'The Inklings'? ', I hear you cry! Ah, you will already know some of the names. The pub and the writer's group may not be widely known, but the members included CS Lewis (Narnia) and JRR Tolkien (Lord of the Rings). We visited Oxford on 28th July and paid a visit to 'The Eagle and Child'. It's a bit like Dr Who's Tardis, far larger inside than you expect. The street frontage is quite modest, but the pub goes back and back, room opening into room after room. It seems the Inklings met in a sitting room towards the back of the building. But we picked a little snug near the street entrance and ordered ice creams. What a delight to sit in this place, so full of history and atmosphere. Looking around, it was quite easy to imagine Lewis and Tolkien coming round a corner deep in conversation about a proposed character for a new story. Those two wrote such good stuff! Tolkien's great series of books ('Lord of the Rings') about the hobbits and other characters describes a classic struggle between powerful forces for evil and weak, humble, sometimes foolish, homely country folk. The hobbits had no idea at first what they were up against, they had help along the way, mostly unlooked for. In the end they succeeded, not because they were powerful, clever or cunning but because they were weak, honest, and open. The enemy was looking for guile and strength, he overlooked simple folk without power. In the end they slipped through unnoticed, too small for the enemy to trouble with. They were courageous, selfless, and focused. Lewis' books about Narnia are even better in my opinion. They are direct parables, written for all who will listen - children and adults alike. Tolkien's tale expresses great truths in a rather general way. But Lewis wrote much more specific stories, direct parables in which Jesus is portrayed appropriately as the great lion, Aslan. The evil queen thinks she can carry the day by killing him, yet to her astonishment and dismay he returns to life; death can't hold him, she has misunderstood the ancient law. But Aslan gave his life to rescue the condemned, knowing that everything would be put right and made new as a result. How fascinating that these two great writers walked these floors, sat in these rooms, ate, drank, and discussed. Their other works are considerable and important. JRR Tolkien was part of the Bible translation team that created the Roman Catholic version known as the Jerusalem Bible. CS Lewis wrote many great books such as 'The Problem of Pain', 'The Four Loves', and 'Mere Christianity'. Both great scholars, both great story tellers, and both knew 'The Eagle and Child' almost as well as they knew their own homes. It's a privilege to have been there. It's an even greater one to have been there with close friends. NASA has done something amazing. One of their spacecraft has made a movie of the Moon passing in front of the Earth as it orbits our planet. This was not a simple achievement! To see things from a suitable distance you need to have a camera position many times further away than the Moon. A hundred and twenty times as far as the Moon would be fine, and this is what NASA has done. Just think, the Moon circles the Earth once every 28 days, drawing out a circle half a million miles across. From our perspective the Moon glides past the starry constellations of the night sky. But if we could travel far enough away we'd see the Moon sometimes one side of the Earth, sometimes the other, but never straying very far. First, sit back and watch the movie. Then come back and read more of this blog post to find out how it was done. In the year 1610 Galileo saw four points of light changing position night by night when he turned his telecope on the bright planet Jupiter. He realised that these points of light were circling Jupiter. It was final proof that not all celestial bodies orbit the Earth and therefore our planet cannot be the centre of the universe as was supposed by the mediaeval church. This is exactly how the Moon would be seen to behave from a camera 31 million miles away, and this is what the video shows. Here's how this amazing video was made. The Deep Impact spacecraft successfully investigated a comet in July 2005, but with its primary mission completed NASA decided it could usefully perform two further tasks. 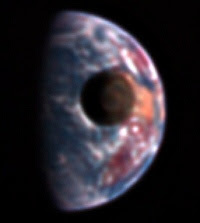 The Deep Impact team realised that they could also use the spacecraft to take images of the Earth and Moon, and they commanded the craft to take a series of images through four different colour filters at 15 minute intervals. Afterwards, the images were combined to make full colour versions and a series of the colour images were put together to make the video. Learn more about Deep Impact (now renamed EPOXI) and the Earth/Moon video from NASA's website. In a recent blog post Frank Viola recommends one of Don Francisco's songs, 'He's Alive'. And indeed this is a wonderful song. Another of Don's great songs is 'And the Spirit Sings', it's one of my all-time favourites and it carries a gentle but strong message that meeting in freedom can be a very special experience because it causes the Holy Spirit to sing. That has been true in my experience, and in Frank's, and in Don's, and in the lives of so many of the people I know and love. To be in a meeting at home, where Yahshua is welcomed along with everyone else, that is a supreme privilege. 'And the Spirit Sings' can be found on Don's album 'Come Away'. If you like Don's style and you've never heard this particular track I strongly recommend you buy 'Come Away', the other songs are great too. The CD's available on Don's website. As I write, the homepage provides 'He's Alive' as a free listen. Go and hear it! Maybe Don will consider putting 'And the Spirit Sings' up there too - how about it, Don? If you want to catch the aroma of meetings of this kind (just a hint of what they're like) read the notes on some of our past meetings. But like a great dish, a meeting in which he's powerfully yet gently present is something that can't be fully appreciated without tasting it. Since 27th July Donna and I have been travelling around the UK with friends from Florida. This has been a time of blessing and fun for me personally, a time I'll always remember. We have packed so much rich experience into just a few short days of living. And it seems to me that this is the way the whole of life should be lived. Life is short, so everything we experience in it should be treasured as a special privilege. The holiday is not yet over, but it's getting closer to the end. Thinking about that brings some sadness, but reflecting on what we've done together brings great joy. Perhaps all of life is like this holiday. It has a beginning and a not-yet-experienced ending. It is a journey. It's a far richer journey when we dwell on the good things and allow the less good to flow quietly into the past and learn patience, wisdom, and trust in the process. The quality of our lives, like the quality of a holiday, is based partly on what we choose to hold onto and what we choose to let slip away without bitterness, anger or regret. Here's a list of the outstanding things we've included so far, the things to remember and dwell on later. Looking at a Norman house - yes, Norman!! It would be easy to write a whole blog post on each of those events. Maybe I'll do just that, it would certainly be fun to write and would make a great diary of the trip. So many happy memories, and still a few more to come. Life is rich, and good, and full. Life is like a meadow in the summer, filled with every kind of flower, dancing with butterflies and shimmering on a hot, dry day. As I write, the rain is pounding on the conservatory roof - but that, too, is a wonderful thing, what a sound! In the garden it's soaking into the good earth and making the plants flourish. They need the sunshine, but they need the rain too. Sunshine and water combining to generate abundant and carefree life. The rain today and perhaps the sunshine tomorrow. 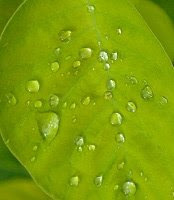 We're rather like those plants, we need sunshine and rain in our lives to truly thrive.